There was also a list of four countries at the top of page 32 on regions most impacted by lead pollution and lead smelting. China was in last place with seven sites impacting 158,100 people. The other three countries/areas totaled more than 1.8 million people impacted by this type of pollution. On page 43, there was a picture of a lead-zinc mining facility in China. On page 59, there was a picture of a chemical manufacturing plant in China. That was it. In seventy-six pages, China was only mentioned five times. What a disappointment. I was expecting so much more considering the amount of criticism heaped on China by its enemies and critics. One city in China was listed as the most polluted in the world in 2006. I wondered why it didn’t make the list for 2011. Linfen, China is situated in China’s southern Shanxi province along the banks of the Fen River. In 2010, this city had a population of about 4.3 million inhabitants. On an end note, Worst Polluted.org mentioned the United States three times, Canada once and India twenty-three times. I didn’t check for any other countries on this report. As I finished posting this series, I realized that I could not score any points with China’s enemies and critics, since it was a country that many in the West love to hate. In addition, I suspect India is mostly ignored by these same people because it was a Western style democracy. I’m sure that you have never heard of a dictator that had term limits—in fact, two different term limits. You may often hear that the president of China is a dictator and that China is a dictatorship. However, the facts say otherwise unless the definition for this term has been changed in recent years to fit China. Therefore, when the president of China is limited to two, four-year terms and/or must retire at age sixty-eight (whichever comes first) and there is a legislative body that has the power to make laws while the courts enforce them (but may not overrule or interpret those laws), does that mean that president is a dictator too? I’ll leave that answer up to the reader. In addition, Article 62 of China’s Constitution says that The National People’s Congress (NPC) “elects the President and the Vice-President of the People’s Republic of China… In Article 63, it also says the NPC has the power to recall or remove from office the President and the Vice-President, which hasn’t happened yet but to be fair, it hasn’t happened in the United States either. I suggest clicking on this link to China’s Constitution and scrolling down to Section 2 to learn the rest. Anyway, these two posts are about the man that may rule China as its president for the next four to eight years. Earlier this month, that man visited the United States and his name is Xi Jinping. We will learn more about him as a person in the next post. I recommend clicking on this link to Chovanec’s Blog to read the rest of his post on this topic. It may be worth your time to learn more about how China works. As I write about my personal experiences in China, I again want to note that they are strictly that—my “personal” experiences. I am certain there are people, who have visited China who could contradict everything that I have, or will write. The products I imported perhaps did not lend themselves to the typical “Sweat Shop” stereotype in terms of the factories that produced them. However, I never saw or visited any factory that, in my mind, would fit that definition. If the factories were not what I would call “modern”—they were certainly clean. The employees (factory workers) wore uniforms at most places I visited. They seemed proficient in their work and the products produced, and for the most part, were without quality problems—certainly no different from products produced in other countries. Most of the factories tended to be in Industrial Parks that were quite large. 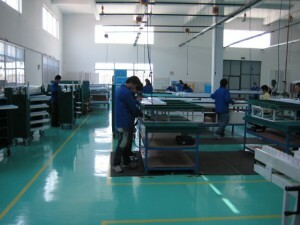 Usually, the factories were a “small city” into themselves. There was housing provided for the employees on the factory grounds along with areas for recreation. I don’t suppose there was another way of doing it, but I saw a lot of laundry hanging from outside the housing units plus commercial apartments buildings I saw throughout China. Most factories had certifications that were either the same or similar to those held by US factories. I saw elaborate R&D sections in most of the factories I visited. The office space was usually as modern and pleasant as any I had visited in the US. A ritual that I truly enjoyed was at every meeting when hot tea was served. Sometimes the owner or general manager had tea to make in their office and other times it was brought in. However, I can’t recall a meeting where tea was not offered. Being a non-smoker, another ritual I did not enjoy was in almost every meeting I attending most of the parties present smoked. I heard a figure once that 85% of Chinese men smoked. I can attest that this is probably a good estimate. Once inside the office or meeting room, the smoke became quite thick and uncomfortable for me; however, I was their guest and felt I could put up with the discomfort in the course of conducting my business affairs. I have fond memories of my factory visits and discussions. I think the fact that I came to China, and met with the factory personnel aided my business immensely versus doing business in name only. When I first traveled to China, I was warned about the food from many well-meaning people—some who had traveled to China and some who had not. I was told that I would starve if I did not take food in my suitcase, so I did. I took trail mix and hard candy nearly overloading my suitcase. It was just one of the stereotypes of China that I had heard and believed before I experienced true Chinese food for myself. For that first trip, I ended up throwing away most of the food that I had brought because I did not want to lug it back to the U.S. I will admit that the food is different from what I normally eat—to be honest, it is definitely healthier. I found there to be a lot of vegetables, fish, and chicken—I never ate Dog or Cat at least to my knowledge. I ate at restaurants and I ate in factories. I ate what was put in front of me, and I stayed in places where my associates stayed. I had customers who went to China on their own for other products. They would not stay in anything but “Western Style” hotels and would not eat anything but “Western Style” food, and there are places in the larger cities, which have both. Some of them would even go as far as to not eat during the day with their hosts—rather waiting until they returned to their hotels for their “Western Style” food. I always felt that was rather rude to say the least and a bit disrespectful. As for the food itself, I found it to be, for the most part, rather tasty. I took my hosts advice and did not drink the tap water. I drank bottled water, their very excellent hot tea, and a lot of their extremely appealing Chinese beer. The food was normally brought out as it was prepared and put on a Lazy Susan. Everyone turned it until the food they wanted was in front of them and then put it on their plates or ate it over, or on, a bowl of steamed white rice. We ate a lot in restaurants in private rooms, which I truly enjoyed. There was no outside noise, and the atmosphere was more personal. When I ate in factories, it was what the employees ate and in their dining area—each experience was unique and enjoyable. I learned to use Chopsticks at least enough to get food from the plate to my mouth. Although people keep bringing me utensils, I stuck with the Chopsticks while in the country. I “never” got sick from anything that I ate or drank in China, which is more than I can say for my normal diet. The food is just one of the misconceptions of China and its people. I believed what I was told until I experienced it myself—not unlike other things in my life that I have been told by others only to be dispelled once I experienced it personally.